Make the most of that garden corner with this space saving Five-Sided cedar garden shed. With a French door and twin sidelite windows, you'll get all the natural light you need. You can find Five-Sided Garden Shed and Pool Cabana dimensions here. 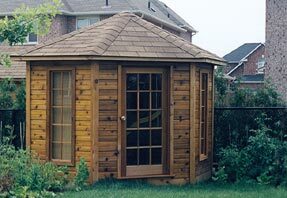 Our garden sheds are constructed with cedar or maintenance-free siding, and cedar doors, windows and trim. All our garden sheds and pool cabanas come standard with 1/2" plywood roof sheathing and 2x4 SPF framing.